Electricity can cause heat as it travels through your wiring. Sometimes where high resistance joints and circuit overloading is present this heating can become excessive and potentially lead to a hazardous situation where an electrical fire may start. This is not only an issue due to the potential destruction from fire, but also due to the downtime caused by no power supply. Test and Tag Safety Services are able to perform preventative maintenance to prevent this occurring. Our fully qualified electricians can thermally inspect your distribution boards to seek out any hotspots before they become a problem. If any problems are found, our electricians are on site to take immediate action if required to prevent any possible electrical system failure or at worst, fire damage. Surveys of electrical systems can expose faults such as poor connections, overloaded circuits and imbalanced loads. 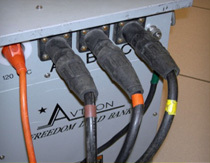 Alternating current often loosens connections which in turn causes breakdowns. In today's industry, downtime is expensive, in terms of plant downtime, idle workforce and customer service. There is a further cost of repairs to be factored‐in and potential damage caused by electrical fires which may result of electrical faults. The reason that Thermal Imaging is so applicable to the inspection and monitoring of electrical installations is that new electrical components begin to deteriorate as soon as they are installed. Wherever the loading of a circuit, vibration, fatigue and age cause the loosening of electrical connections, while environmental conditions can hasten their corroding. Briefly stated all electrical connections will, over time, follow a path towards failure. If not found and repaired, then these failing connections will lead to faults. Fortunately a loose or corroded connection increases resistance at the connection and this increased resistance causes an increase in heat. Electrical thermal imaging will detect this developing fault before it fails. 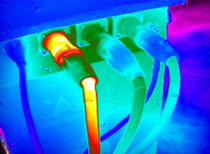 Thermography is used as a proactive diagnostic tool, which allows the detection of developing faults, before they cause system failure or worse problems such as an electrical fire. Thermal imaging measures the radiant heat pattern which is emitted from electrical components in systems such as building power distribution or plant equipment. Schedule proactive maintenance, rather than pay additional costs for emergency or unscheduled repairs. Services provided by licensed "A" grade electricians. Record of testing for your OH&S documentation. Availability of after-hours and weekend services, Should you require it. On site repairs and maintenance, Should you require it.